Last year was windy; this year was light, sunny and warm – great sailing! 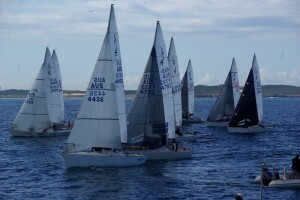 The Macquart Marine Cronulla J/24 Short Course Regatta was conducted in the clean clear waters of Bate Bay, Cronulla over the Queens Birthday long weekend of June 6-7, and was a huge success again. It was enjoyed by 17 crews including three from interstate: Simon Grain and Hugo Ottaway from Victoria with smiles and the odd ‘discussion’ and Robin and Jim Townsend from Adelaide (well done guys!). This year there was a definite buzz about the club from a few days before, with excitement growing as the interstaters rolled in. With lots of help from the enthusiastic locals, boats were rigged, dropped in the water and berthed on the club pontoon three shakes of a skippers tiller from the club bar. What a magic setting – drinks in the sunset and the promise of a great weekend to come. Bucko, the nation’s most relaxed RO gave us the briefing on Saturday morning, how refreshing to hear some sensible race management outlined. There will be no protests! Sort it out on the water. With breezes between 0-5, the race committee did a fantastic job in achieving three races on the first day. With temps at 22 deg C, a glorious day of sailing was had and a following swell upwind made interesting sailing for those not used to ocean sailing. The first race was won by local legend Dave McKay by 30 sec to Victorian Hugo Ottaway and Stephen Quigley a further 30 seconds behind. The short course format, with works no more than 800 metres, ensured close competition for all. 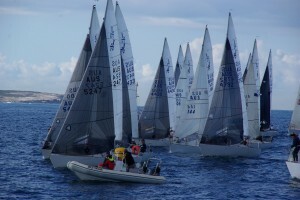 The second race was won by Stephen Quigley in a dying breeze who picked the shifts and extended to win by some three minutes to Simon Grain of Victoria and local Cronulla sailor Barry Ryan. 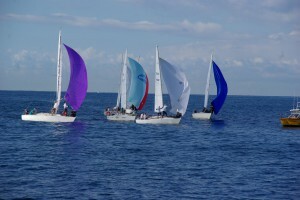 The third and last race for day one was conducted after waiting for a 5 knot breeze to reestablish from the east, and in a dying breeze Barry Ryan again showed his local knowledge to lead out by 30 seconds to Robin Townsend from South Australia and Hugo Ottaway in Brushetta IV from Sandringham Yacht Club. Racing was completed for the first day with Barry Ryan in Pinot leading from Stephen Quigley and Dave McKay equal in second. The Day One BBQ was huge – these guys know how to be hospitable with a vengeance, including great conversation between all competitors and lots of new friends being made with the visitors going into the night in preparation for day two. In fact many competitors further increased their preparation at local nite clubs just to make sure they were ready for the off in the morning. Again the balmy winter conditions continued with a slight increase in wind strength experiencing 5-10 knots for the fourth race of the series. Victorians took both first and second with Simon Grain and Hugo Ottaway, followed by the ever consistent Stephen Quigley coming in third. A quick turn around by the race committee saw race 5 commence and the pattern of finishes becoming clearer: Barry Ryan followed by Stephen Quigley and Hugo. This was undoubtedly the closest race of the series with the first five boats finishing within 40 seconds, the next four within 40 seconds and the next six within 30 seconds. Fantastic close racing of two laps, over in 27 minutes and all boats finishing with four minutes! Race 6 commenced under the black flag after two consecutive general recalls. Julie McKay on McKay Marine, Jared Macquart on Macquart Marine, Matthew Short on ShortFaced and Lia Darby on Starpac all broke the start and were disqualified from that race. Final results in a dying breeze was Simon Grain, the consistent Stephen Quigley and Barry Ryan in third. Race 7 proved to be the final race of the series in testing conditions and a breeze continuing to decrease. Simon Grain rose to the occasion with a third bullet for the day followed again by Team Cini O’Bryan and StockCar. Results were tallied back at the Cronulla Sailing Club as the sausages cooked and the drinks where poured. The same Bucko, now the master of ceremonies and laughter, gave out the prizes and everyone got one (if you didn’t win one, you got one given to you). What a good night.